For the aircraft nicknamed after this character, see Antonov An-72. 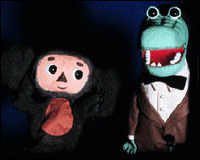 For the 1971 film, see Cheburashka (film). Cheburashka (Russian: Чебура́шка, IPA: [tɕɪbʊˈraʂkə] ( listen)), also known as Topple in earlier English translations, is a character in children's literature, from a 1966 story by Soviet writer Eduard Uspensky. He is also the protagonist (voiced by Klara Rumyanova) of the stop-motion animated films by Roman Kachanov (Soyuzmultfilm studio), the first film of which was made in 1969, with songs composed by Vladimir Shainsky. Cheburashka is an iconic Russian classic cartoon character who later became a popular character in Russian jokes (along with his friend, Gena the Crocodile). According to the creator of the character, Eduard Uspensky (1965), Cheburashka is an "animal unknown to science", with large monkey-like ears and a body resembling that of a cub, who lives in a tropical forest. He accidentally gets into a crate of oranges, eats his fill, and falls asleep. The crate is eventually delivered to a grocery store in an unnamed Russian city (hinted to be Moscow), where the rest of the main story unfolds. Cheburashka is male, has a bear-like body, large round ears, and is about the size of a 5-year-old child. After being turned down by the zoo as an "animal unknown to science," Cheburashka gets hired as a window display for a discount store selling factory seconds because he resembles one, residing in a phone booth. In the tale, he befriends an anthropomorphic crocodile named Gena, who wears a hat, a bow tie and a coat, and plays the accordion. Gena works in a zoo as a zoo animal. Gena's favorite songs are "Such a Pity that One's Birthday Happens Only Once a Year" and "The Blue Train Car," both of which are extremely popular with children. In the cartoon, Cheburashka and Gena have their adventures made more difficult by a character named "Старуха Шапокляк" (Old Lady Shapoklyak, from French chapeau claque, a kind of collapsible top hat). Shapoklyak is a mischievous but charming old lady. She is tall and thin, wears a hat, a dark-coloured dress, and bloomers, and carries around a pet rat, Lariska, in her purse to help her play pranks on people, though near the end of some stories she turns around and helps the protagonists. The chorus of her theme song contains her motto, "One won't ever get famous for good deeds." Cheburashka in 1965, in the first edition of the book. The rights to the Cheburashka character and image have been heavily debated in court. In 1994, Eduard Uspensky (the writer) copyrighted the character's name and image and proceeded to sell the rights to various countries. Leonid Shvartsman, the art director of the animated films, has tried to prove in court that he was the creator of Cheburashka's visual appearance and that this copyright should be separate from the rights for the literary character. On 13 March 2007, Shvartsman and his lawyer lost a 4.7 million ruble lawsuit against BRK Cosmetics and Eduard Uspensky. Shvartsman alleged that Uspensky sold the rights to the Cheburashka image (which was allegedly not his to sell) to BRK Cosmetics, which used it on packets of toothpaste. The defence argued that the artist who drew the character for the packets had never seen the animated films and, despite the fact that the character on the packets was an exact copy of the one in the animated films, had created the character himself after the impressions left from reading Uspensky's books. Vladimir Entin, defender of Shvartsman's interests, suspects that the jury had to have been bribed in order to hand such an unlikely verdict, but admits that there is no proof. 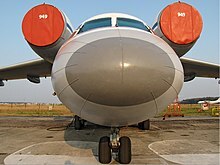 The Antonov An-72 is said to resemble Cheburashka when viewed from the front. Cheburashka is now a staple of Russian cartoons, and there are several licensed products on the market, such as children's joke books and stuffed toys. He is also one of the few Russian animation characters to be the subject of numerous Russian jokes and riddles. The word "Cheburashka" is also used in a figurative sense to name objects that somehow resemble the creature (such as an An-72 aircraft which, when seen from the front, resembles the character's head) or are just as pleasing as it is (e.g. a colloquial name for a small bottle of lemonade – from the brand name "Cheburashka"). Cheburashka also became known in some countries outside the former Soviet Union (and of the Soviet Bloc). He became very popular in Japan after an animated film series about him was shown in 15 cinemas all over Japan and was watched by about 700,000 between summer 2001 and spring 2002. In 2008, the Cheburashka films (as part of the "Ghibli Museum Library") were made available to Japanese cinemas on the same date as Hayao Miyazaki's Ponyo on the Cliff by the Sea. An English-dubbed edition of at least one of the animated films was released in 1987, titled The Adventures of Charlie and Cubby. Screenshot from "Drutten och Gena"
But that is where the similarity ends. The two characters sang and told different stories from those in the USSR, lived on a bookshelf rather than in a city and are hand puppets operated in live action rather than stop motion. Only occasionally Swedish public service TV would broadcast a segment of the Russian original, dubbed in Swedish. So, while many Swedes may visually recognize Cheburashka, they will generally not associate these characters with the ones Russian children know. Cheburashka dolls and other collectibles are produced in Russia, Japan and China. United States National Champion figure skater Johnny Weir is known to be an avid collector of Russian Cheburashka items. The white and red Olympic mascots were made in three sizes – 14 cm, 18 cm and 27 cm – and wear a sponsor's jersey with the "Bosco Sport" logo on the chest. T-shirts with Cheburashka are common, including several versions with the character drawn as Alberto Korda's Che Guevara photograph, labeled "Che Burashka". Ivan Maximov had said in a 2004 interview that Pilot Studio had been planning to make a Cheburashka feature film and that the scenario had been written out and possibly some footage shot, but that it had been frozen for lack of funds. Cheburashka's popularity in Japan is such that on 4 April 2006, TV Tokyo broadband issued a press announcement that it (in partnership with Frontier Works) has acquired the rights to remake the Cheburashka shorts as a feature film. It is unclear if this was the project that Pilot Studio had been forced to abandon. It was announced that the film, like the original shorts, will be based on puppet animation enhanced with modern stop-motion technology and computer graphics effects (similar to the plans for the Pilot Studio film), and would be shot simultaneously in English and Russian. In March 2009 it was announced that the new Cheburashka animation would consist of a new animated series, called Cheburashka arere?, which ran for 26 3-minute episodes. Cheburashka arere? premiered on the Nori-Suta 100% television program on 7 October 2009. The new film, only titled Cheburashka is produced by both Ffango Entertoyment of South Korea and Frontier Works of Japan. Directed by Makoto Nakamura and written by both Mikhail Aldashin and Michiru Shimada. The film opened in 8 December 2010 in Japan. The film's theme song is titled Orange, performed by Kaela Kimura. A shot-for-shot remake of the shorts also titled Cheburashka was released on June 15, 2014 in Russia. ^ "Список фильмов" (in Russian). Official E. Uspensky website. Retrieved 2009-12-11. ^ "Cheburashka Classics Archived 2011-05-12 at the Wayback Machine". Frontier Works, Inc. Retrieved 2009-12-11. ^ Dahl, Vladimir (1882). "Чебурашка". The Explanatory Dictionary of the Live Great Russian language: Er-Ve (in Russian). Спб. : Изд. Т-ва М. О. Вольф. p. 603. OCLC 1661885. ^ Sheveleva, Aleksandra (December 13, 2006). "Чебурашку разбирают в суде" (in Russian). BBC News Online. Retrieved 2009-12-11. ^ Anufrieva, Anna (March 13, 2007). Как заработать на Чебурашке. Delovoy Peterburg (in Russian). Archived from the original on March 22, 2007. ^ "The Adventures of Charlie & Cubby (1987) - - Synopsis, Characteristics, Moods, Themes and Related - AllMovie". AllMovie. Retrieved 4 December 2017. ^ Rasskazova, Tatyana (16 August 2004) "Иван Максимов: по дешевке «Симпсонов» не сделаешь" (in Russian). Ogoniok 33 (4860). Retrieved 2009-12-11. ^ Ozler, Levent (April 12, 2006). "Cheburash : Animation Phenomenon Goes to TV Tokyo Broadband". Dexigner. ^ "Russia's Cheburashka Character Gets Japanese TV Anime". Anime News Network. September 3, 2009. Retrieved 2009-12-11. ^ "The future looks bright for companies that moved into the Gyeonggi Digital Content Agency". Retrieved 4 December 2017. Wikimedia Commons has media related to Cheburashka. This page was last edited on 27 March 2019, at 11:07 (UTC).